Justin is a worrier. He can overreact and I often under react. I’ve been known to feel a little superior in my calmness. He went to the store at least twice a day for popsicles, drinks and medicine. He put work on hold to play rocket league for the 500th time. He bought multiple thermometers to make sure we had accurate readings. Each temperature taking involved three different tests, because you can never trust just one. He sat on the couch for hours and was there with whatever child was currently unable to move. I, on the other hand, tend to make kids go back to doing their chores as soon as possible, ask them if they’re really still hurting or if they just don’t want to go to school, and beg them to please, please turn off the screens…. Josh at 27 in a 48 hour period. Some people got in a few of our plans. Two sets of cousins, one before, and one after Christmas. Horses were ridden, hot dogs were eaten. Games were played. More pictures of the fun parts if you’d like to see. This is True Love A Schedule Free Summer Hawaii Part 1 They need to know…. Hurricanes, earthquakes, refugees, genocide, prejudice, and now a mass shooting in my backyard. There is so much to do, so much we can do, and yet often I don’t know where to start. I see the devastation spinning through my social media channels and in the news, it hurts my heart. We’ve discussed as a family what we can and should do to help, and yet, as of right now I am doing and have done very little. But I want my kids to know. You always can, and always should, do something. A couple weeks ago, circumstances sent me to both the public health department, and the local family clinic – which cater to the uninsured and underinsured. I live in a fairly homogenous small town. It’s easy to believe that everyone is doing fine. There is no poverty, no hurt, no hunger. False. The waiting room was full of people that would rather go somewhere else but had no other option. Some had obvious health conditions, some had obviously had better days, some were pleasant, some were cranky. The receptionist smiled at everyone. I left, but the smile of the receptionist stayed with me. She brightened what could have been a miserable place. Does a “simple life” make us selfish? Five Thoughts on a Friday (now a Sunday) The And Motherhood is for Me. These are all crappy cell phone pictures, but it had to be documented. 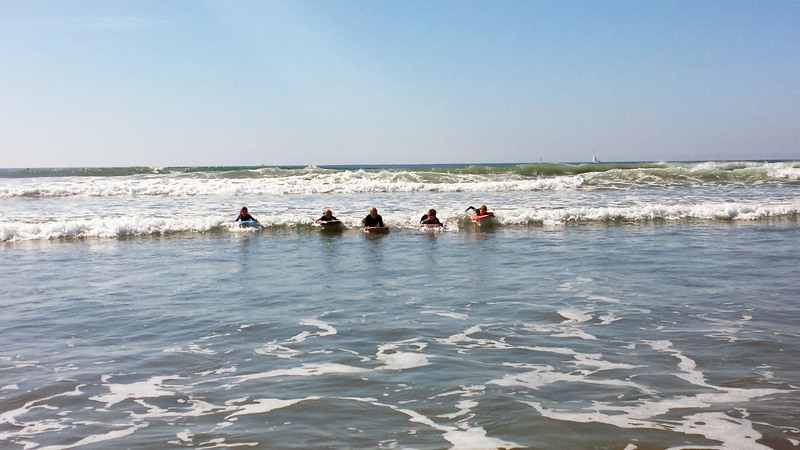 The entire Taylor family (and cute cousin Natalie) riding a wave at the same time. 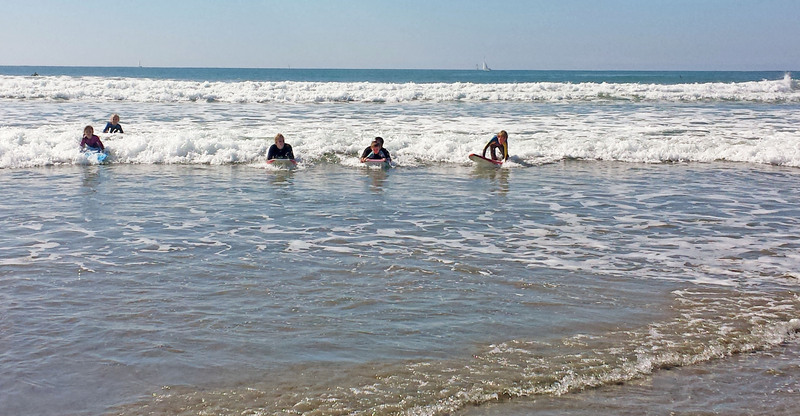 Justin’s happiness would be complete if we were only all on surf boards.